One of the things I like about being here is that we don’t get too much food imported from all around the globe all year round so the different seasons bring different foods. 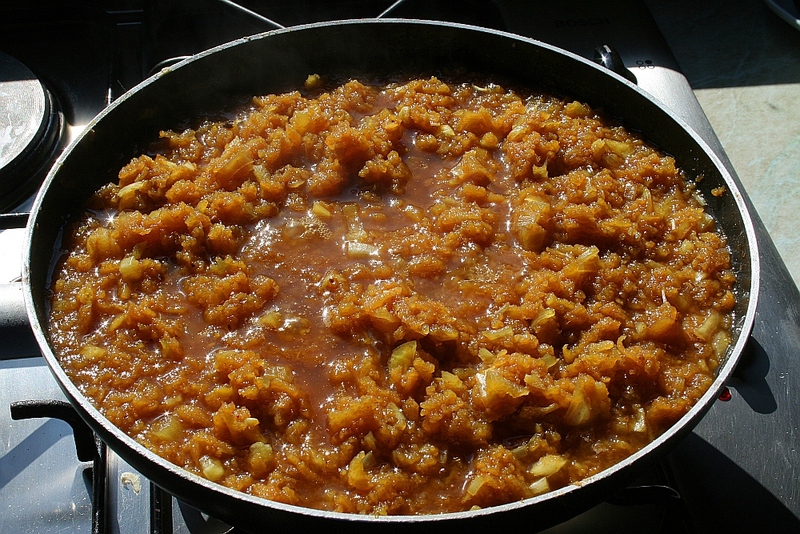 At the moment quince and green apples are in abundance so I decided to make some quince chutney. I made some a few years ago and it lasted for two years but I made a few changes to this year’s batch. This is a great addition to meat or cheese sandwiches and goes well with roast chicken and most curries too. 2½ kilos of quince finely diced or coarsely grated. 1 level teaspoon (tsp) Cumin seeds. 2 heaped tsp Coriander seeds. 1 level tsp Cayenne pepper (Tatli Kirmizi Biber). 1 level tsp ground Turmeric. 110g fresh root Ginger (Zencefil) peeled and grated. 8 cloves of Garlic peeled and crushed with 2 tsp Salt. 2 Spanish type onions finely chopped. I prefer my chutney to be more finely cut so I use a coarse grater on the quince rather than chopping it. You can use malt vinegar if you like, I prefer to use apple vinegar but experiment with others if you wish. If you chop the garlic then mix it with the salt and crush it with the side of a big knife it makes a paste which blends into the mix well and doesn’t cause any exciting surprises. You could use the same recipe but substitute green tomatoes for quince. This picture shows the mixture at the start of the simmering process. Peel and grate/chop the quince. Put in a large bowl with the sugar and turn to distribute and mix it all well. Cover with clingfilm and leave in the fridge overnight. Preheat a small frying pan and dry roast the cumin, coriander and cardomom. Crush or grind and put into a large preserving pan or saucepan add the quince and bring to a gentle simmer and let it simmer for 3 hours stirring from time to time. The liquid will turn to a thickish syrup. Remove from the heat and let it cool for 15 minutes or so then ladle into warm sterilised jars. Leave in a cool place for 8 weeks minimum.